Volunteers | School Business Partnerships of Long Island, Inc. Volunteers are an essential part of the success of our committees, events, and competitions. Volunteers are needed at all levels and in a variety of capacities. Each event requires an abundance of volunteers with a broad spectrum of talents to support the operating needs of the competitions and fundraisers. 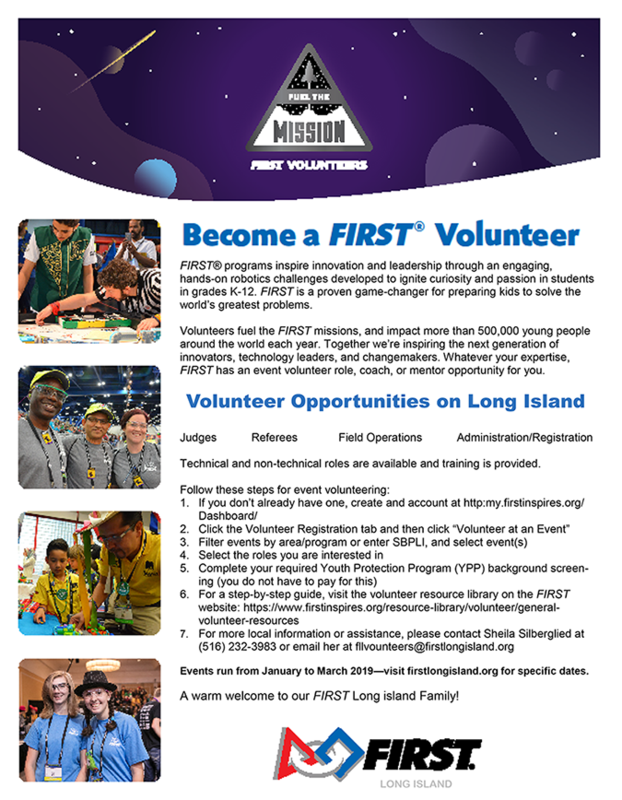 Visit the the FIRST Robotics Competition, the FIRST Tech Challenge, the FIRST LEGO League, or FIRST LEGO League Jr. Volunteer pages to learn more about each program’s specific volunteer opportunities. If you are interested in becoming a FIRST mentor or a team sponsor, we recommend visiting the FIRST Website to find out which events are in your area. Attendance is free and you will be able to see a competition first-hand and can meet teams from your area. Rookie teams especially benefit from strong professional mentoring and will welcome additional support. FIRST has prepared a Mentoring Guide to introduce you to the mentoring philosophy, goals and process, and to outline the tools you will need to be a successful mentor. Please contact the organization and/or the individual program leadership to discuss your talents, interests, and availability to support SBPLI. For additional information, please contact SBPLI. For more information on how you can volunteer, visit the FIRST website.